There are two consistent complaints about the Bradley. One is that it doesn’t carry enough dismounts. The other is that it’s not well protected enough. The US Army has made several attempts to rectify both of these issues. Today, we’re going to look at an alternative design to fix the latter problem: the Special Armor IFV, which dates to around 1978. A brief editor’s note: since I’m working off an old US Army report, all weights below are in good, been-to-the-moon, American tons. 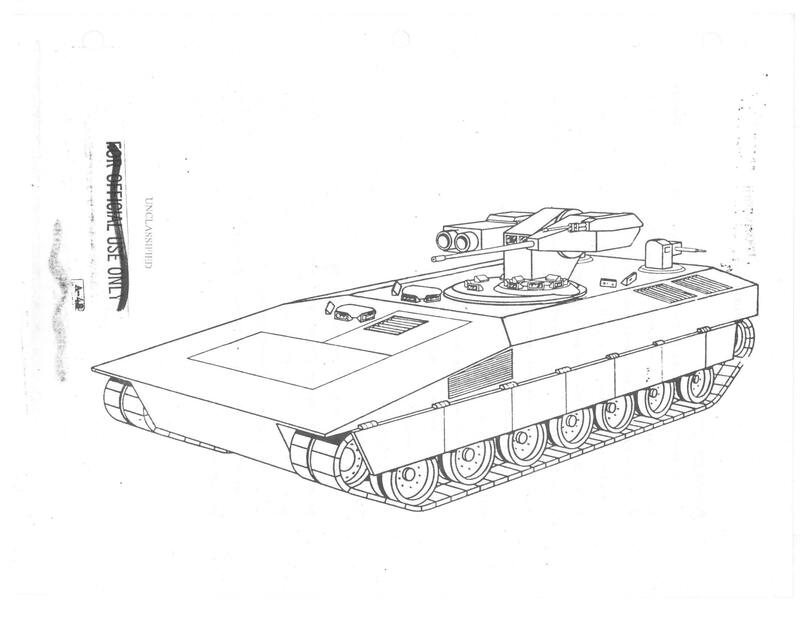 “Special Armor” is a standard euphemism for the various composites used in the armor arrays in the M1 Abrams, and the goal of the SAIFV was to incorporate some of the key capabilities of the notional IFV1 in a vehicle with similar protection levels as the XM1. It would still have the 25mm Bushmaster autocannon and TOW missile launchers, plus a capacity for a three-man crew and six dismounts. 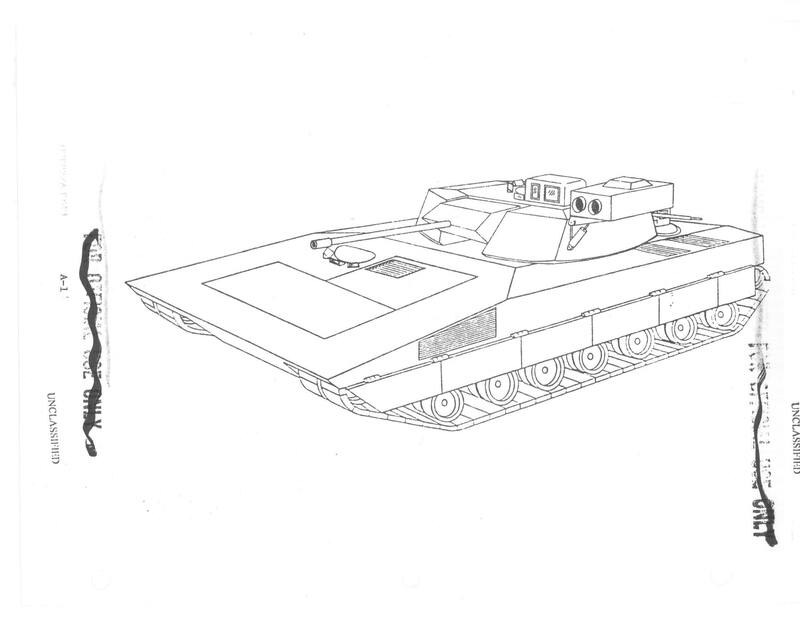 Engine and transmission were to be the same as those on the Abrams, albeit mounted at the front of the SAIFV. The suspension was also the same as on the Abrams, and the hull was a derivative. A few different layouts were considered. Two had a conventional two-man turret. One of these had protection equal to the XM1, and it had a projected weight of 65 tons. A second version had the same turret but reduced side hull armor to get the weight down to 60 tons. A third variant had hull armor optimized to defeat expected threat HEAT rounds only, which also resulted in a projected weight of 60 tons. 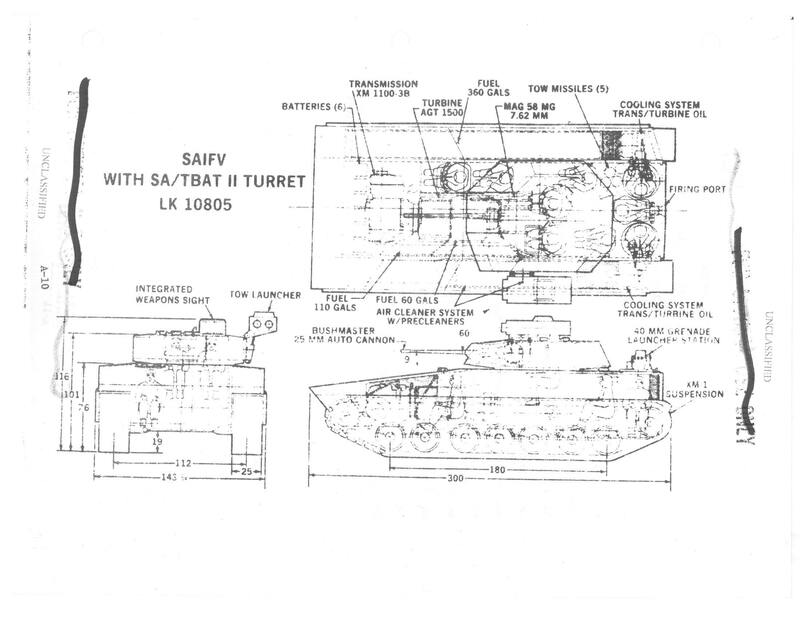 All of the manned-turret versions had XM1-equivalent armor on their turrets. Additionally, two low-profile turret options were considered. One had the standard Bradley weapon package in a low-profile, Marder-like turret, with a two man crew in the basket. This version had XM1-equivalent hull armor on the front and sides, and the remote turret protected against small arms only. It weighed 59 tons. There was also a shorter version with the pod turret and only six roadwheels that weighted in at 55 tons. A version equipped with the 75mm ARES2 gun in a remote turret instead of the standard IFV weapons suite was also considered. This turret led to a projected weight of 60 tons. Pictures below. 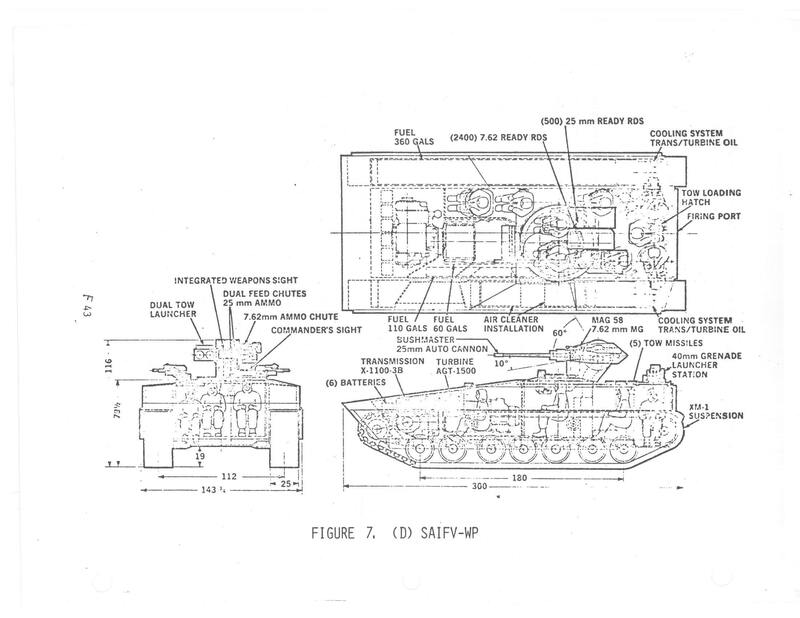 Of note is that the pod-turret version held 500 rounds of 25mm instead of the 300 rounds in the Bradley. Ammo stowage on the manned-turret SAIFV is not specified. For comparison, the XM1 prototypes had a combat weight of about 58 tons (per Hunnicutt) and the initial versions of the M1 had a combat weight of 60 tons. Also remember that in a lot of ways, the initial versions of the M1 were compromises. Future versions would be upgraded with more armor and the 120mm gun. Let’s look at some costs. These are all projected figures, so take them with a tasty helping of salt. However, since they’re all projections, we should be able to make decent comparisons. 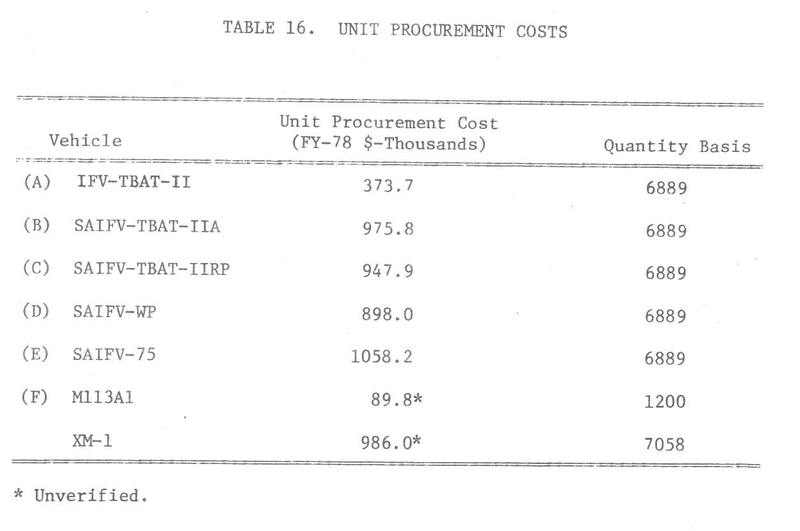 From the cost table, we can see that the SAIFV is considerably more expensive than the Bradley. The Ares gun version is more expensive than the XM1; the other versions are similarly priced to the XM1. And now, what I think. My preferred version would be the SAIFV-WP version with the Marderlike turret. I’m a big fan of low-profile turrets these days, and I think the improved armor is worth the price. And with the weight being in the same ballpark as the XM1, there should be plenty of weight allowance for future upgrades without overtaxing the chassis. I could also see armoring the turret against threats equivalent to its own gun, but as far as I can tell, this wasn’t considered in the report. This entry was posted in All and tagged armor, history, militariana on November 13, 2018 by parvusimperator. No wonder the Lima Tank Plant was so enthusiastic about building Namers for Israel. Apparently they had been planning to do it for 30 years. Haha, yup. They’re very similar concepts. Probably born out of the same note-taking from the Yom Kippur war too.